After deliberation, Vitauts decided to let the Mercury die. I had to explain the insurance situation a few times. Basically, he had three choices after we found out that the fuel pump was broken. 1) He could fix the car’s body damage and the fuel pump and end up paying $1,000 or more out of pocket to repair a 22 year-old car with 230,000 miles. 2) He could use the body repair insurance money to fix the fuel pump. or 3) Take the insurance money, get rid of the Mercury and look for a replacement car. He didn’t quite understand how the insurance company was going to give him money. This is one of the extreme disadvantages Vitauts has had in his life… he doesn’t get business. I think he’s pretty much been a consumer victim his whole life without a full understanding of commerce or sneaky sales people. We had a good time talking about all the lemons he has purchased in the past including the Ford station wagon that had bizarre electrical failures shortly after he purchased it. Paul is still mad that dad just got rid of it instead of letting him have it. Dad had some pretty terrible cars that he probably overpaid for. All of the kids pretty much ended up owning one of his hand me down Oldsmobiles, Fords, or Chryslers. Out of all the American sedans he had driven, he had never owned a Cadillac. A long time ago, I remember asking him what kind of car he would like if price weren’t an issue. He answered, “I would like to drive a Cadillac.” I never forgot that. So on a lark, I decided to see what kind of Cadillac I could get in the price range that the insurance company was giving for the repairs which was just over $2000. I felt like I was making my own episode of Top Gear, the British Auto Series formerly starring Jeremy Clarkson. On that show, they have challenges where they are given a certain amount of money and a specific type of car, and then they need to see which of the three cohosts can find the best car in that category. I think Jeremy would be proud of my endeavors, even if I was looking for Cadillacs which are generally shunned by the automotive critics. I first tried Auto Trader and found some decent Cadillacs from 2004 or so with about 150,000 miles in our price range. I extended my search to Craigslist where I came across a 1987 Cadillac DeVille with only 44,000 miles on it. It was light blue, and for some reason it just called to me. I have a little confession to make, one of my life-long fantasies has always been to find a car from my high school days and restore it to its original condition. My first car was a 1979 Oldsmobile 98. It was white and had a 403 c.i. 4 barrel producing over 200 horsepower. I had a love/hate relationship with it, but lately the reliability issues have slowly faded from my memory and mostly the warm fuzzy feeling of driving flat-out south of Yutan with the needle buried and loud music blaring have entered my mind. So there it was, a car from my youth in almost perfect condition. I was able to take a look at the car and give it a test drive. I went to Bellevue and found it sitting on a driveway on an acreage with chickens and sheds. The car wasn’t much to look at. One of the tires was a little flat, it was covered in dust, but underneath the dirty exterior it was gorgeous. Once I got inside, I knew that I had to have this car. Everything was perfect. The interior was clean, no fading or cracking. The odometer read 44,537 miles, as promised. It started right up, and after I drove it, I was a bit obsessed (Christine anyone?). Shawn, the seller of the car, was selling it for his father. He told me how he and his dad ran a yard service, and that they bought the car from a little old lady whose husband had died, and she didn’t drive. That’s why it had such low mileage. They thought that they would use it as a second or third car, but after a year, they found that they really didn’t drive it much, so they wanted to find a buyer to make back what they had paid for it. I ran a Carfax, and he was telling the truth. This car had been babied. 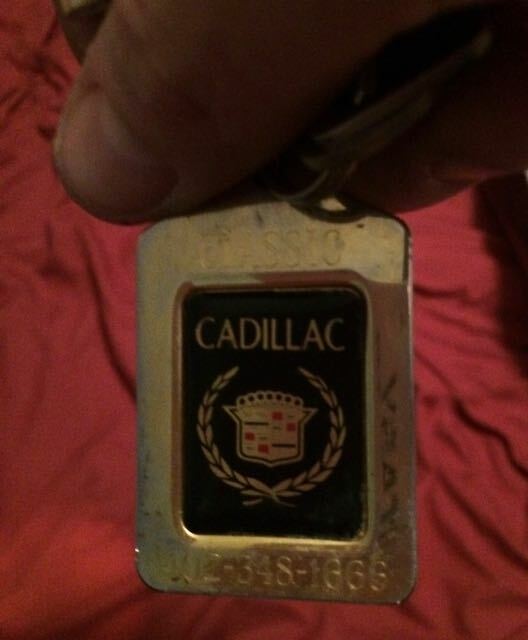 Every Cadillac Dealer service was on file on Carfax, and it was clear that this was completely legit. I picked up Vitauts (after going to the bank to get the money) and took him for a test drive. He didn’t really seem to believe that we could just go and get a car. To him, it was a process. You test drive. You get a loan. You get a check. Make appointments and on and on. I was trying to explain to him that he needed a car, and we could just pick it up today, but it was a bit of a hard sell. I wanted this car! So we bought it! 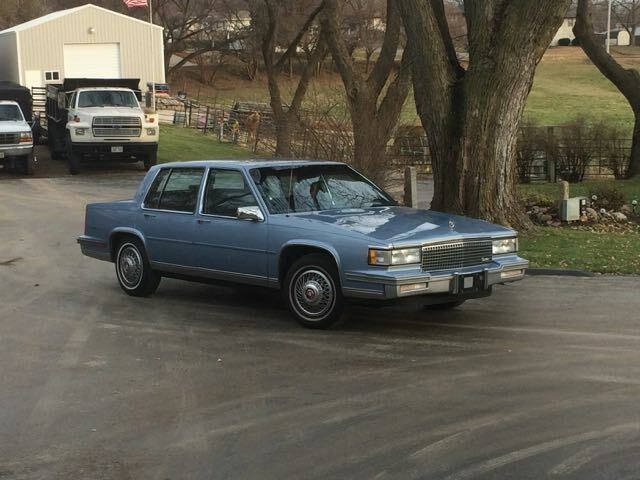 He drove it home without a hitch, and he is now the proud owner of a 1987 light blue Cadillac DeVille with more ashtrays than cup holders, only 44,544 miles, and lots of miles left to go! More on this to follow!